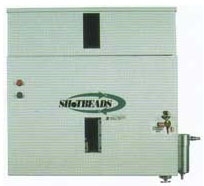 SHOTBEADS are used with the S-2 dispensing machine which air assists the beads into the cold chamber when the shotarm retracted. The S-2 is an air/electric loading mechanism which adjust to any size machine, and is used with or without programmable logic control. Replacement parts are available throught easy web access. 2 Voltages available : 110 VAC, 24 VDC standart air pressure. Finish : Tough 0.5mil. polyurethane paint (beige color). large site glass to monitor bead level. Integrated air filter with built-in water/oil separator. Indicator lights : supplied by "power on" and cycle indication. Locking hinged front cover (tamper proof). Adjustable flow control valve for bead air flow stream. Fully adjustable, friction free Delrin plastic slide chamber-for "beads per shot" control. Large 15 lb. (6.8 kg.) hopper capacity. Automatic low-level sensing logic for interfacing with alarm or machine shutdown (protects tip and sleeve before dispenser is empty). Off-delay timer required for non-P.L.C. operation. Screen to filter unwanted debris. Hopper extension for up to 20 lb. capacity. Normal dosing capacity for small to medium tonnage machines. Large dosing capacity for 800 ton and higher machines.